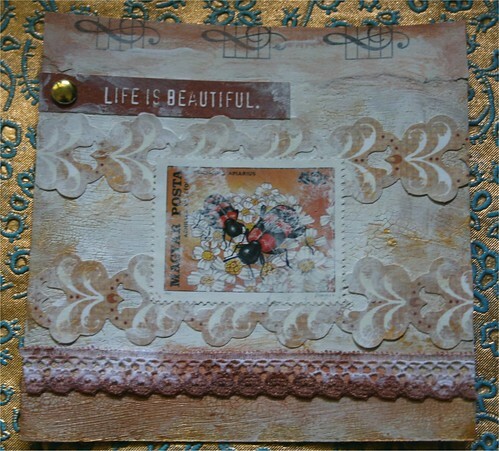 Life is Beautiful 4" x 4" Collage Card, originally uploaded by DianthusMoon. This is like the companion card to the ‘Believe in Miracles’ card below. I think I will do more painted backgrounds in the future! We ate at a Mexican restaurant called ‘On the Border’. Very good and almost like homemade. When we got home I saw that Brian had picked 4 tomatoes! Yay, so good on sammies. And saw that the nurse didn’t call me back, so I’ll continue with the calcium blocker. Not risking my health when my bp only needs to be less than 10 pts less at times. Should have bought some natural diuretics like watermelon and asparagus at the produce place! I never knew watermelon and asparagus were natural diuretics . I eat a lot of both. I am so envious that you are eating fresh tomato sandwiches! We don’t usually get to do that until August.